At first glance there would appear to be no relationship, either in time or space, between the heart of a champion racehorse and brain of a great physicist. One became famous while the other languished in obscurity for 23 years. It finally turned up in Wichita, Kansas – in two mason jars in a cardboard box shoved under a beer cooler. But they do have something in common. Both clocked up a lot of post-mortem travel miles. There is another similarity too. The former — or at least parts of it – also went missing for years after its New Zealand-born host, aged 5, mysteriously haemorrhaged to death on April 5, 1932, at a ranch near Menlo Park, California. Two weeks earlier he had won the Agua Caliente Handicap in Tijuana, Mexico – then the richest prize in North American racing – in track-record time. A lot of folk in fedoras lost more moolah that day than the Fat Man in Dashiell Hammett’s The Maltese Falcon. The cause of death was apparently acute bacterial gastroenteritis – duodenitis-proximal jejunitis – possibly induced by arsenic poisoning. A few folk in fedoras may have been involved in some horseplay. Whatever the case, the thoroughbred’s ‘iconic’ heart is now a religious relic. It is venerated more than the sacred left-upper canine tooth in Kandy’s Sri Dalada Maligawa temple, the cave of Massabielle at Lourdes, or even 3764 Elvis Presley Boulevard, especially before a big race. Weighing twice the size of that of an average equus caballus – an ‘astonishing’ 6.2 kg – it is one of the most popular exhibits at the National Museum’s Landmarks gallery in Canberra. As for the stallion’s 1.74 metre high hide, it is stuffed and on display in the Melbourne Museum, one of the few exhibits in that politically correct institution not invoking the oppression of Aborigines, the raw deals foisted upon women or the general and soulless ugliness of Australian life. The skeleton’s final resting place, however (‘each and every bone a national treasure’) is across the ditch in New Zealand’s Te Papa Museum, presumably in homage to his Timaru birthplace. But the four-legged legend did not have a Maori name. He was called ฟ้าแลบ [fáː lɛ̂p] – literally ‘sky flash’ – by the son of a Zhuang-speaking Chinese immigrant. The Zhuang (and Thai) word for lightning was an inspired choice. Phar Lap won 37 of his 51 starts, including the 1930 Melbourne Cup, two Cox Plates, an AJC Derby and 19 other weight-for-age races. Aficionados of equine anatomy received some good news in September, 2014 (Audio here). A National Museum conservator finally found the missing pieces mentioned above — parts of the aorta, a ventricle and pericardium – while cleaning specimen jars. “We are thrilled that we’ve been able to find a few more parts of the most famous racehorse in history,” senior curator Dr Martha Sear enthused, noting the heart (left) has ‘quite a big triangular slice’ taken out of it. Not everyone, however, accepts the official version. 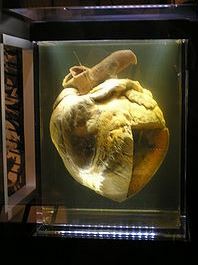 In 1979, the daughter of Dr Walker Neilson, the government veterinarian who performed the first necropsy on Phar Lap, said she was told by her father his heart was necessarily cut to pieces during the autopsy. The one on display is that of a draught-horse. The post-mortem journey of the latter — the physicist’s brain — is even stranger. Its 76-year-old German-Jewish host died sixty years ago, from an abdominal aortic aneurysm, at 01:15 am at Princeton Hospital, New Jersey, on Monday April 18, 1955. Einstein was offered surgery. But knowing the chance of recovery was low, he declined: “I have done my share. It is time to go. I will do it elegantly.” Next to his bed was the draft of a speech that he was to deliver on Israeli Independence Day, and an unfinished unified-field theory calculation. He left the scene precisely half a century after revealing his special theory of relativity (STR) to the world in ‘On the Electrodynamics of Moving Bodies’ (Zur Elektrodynamik bewegter Körper), a paper in the 1905 journal Annalen der Physik. Eleven years later, his general theory of relativity (TGR) was published there in another paper: ‘Basis of the General Theory of Relativity’ (Grundlage der allgemeinen Relativitätstheorie). Not bad for a person once called ‘a lazy dog’ by his Swiss maths professor. Both papers can be read here and at Einstein Archives Online. Perhaps this anecdote inspired director Nicholas Roeg’s cheeky role-reversal scene in the 1985 film, Insignificance. Cut to a New York hotel room one hot summer night in 1953. In a nine-minute segment (here), it is Theresa Russell, playing “The Actress” (Marilyn Monroe) with great panache, who gives “The Professor” (Michael Emil) a lecture on the STR. According to Otto Nathan, Einstein’s executor, he wanted his body cremated and ashes scattered privately in the Delaware River — at an undisclosed location near Trenton, New Jersey — on the afternoon of his death. No pilgrimages. But a front-page article in the New York Times that day announced that “the brain that worked out the theory of relativity and made possible the development of nuclear fission” had been removed “for scientific study”. Before cremation there had to be a routine autopsy. 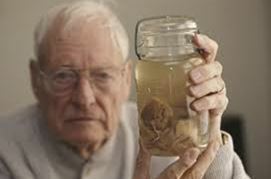 Thomas Stoltz Harvey (1912-2007), the Hospital pathologist, removed Einstein’s brain during the process, but apparently without family authorisation. Correct weight was 2.65lb (1,230gm) and – unlike Phar Lap’s heart – ‘well within the average range’. He put it in a Tupperware lunch-box filled with formaldehyde, left the scene and presumably called the newspaper. A 2011 episode (video here) of the US Science Channel show Dark Matters: Twisted But True features a ghoulish re-enactment of the event. Years passed. Dr Harvey was dismissed from Princeton in 1960, some say because no comparative neurological papers had appeared anywhere. The pathologist, with what remained of Einstein’s brain after much slicing, dicing and distributing, slipped into anonymity. In the spring of 1978 a journalist with the New Jersey Monthly, 27-year-old Steven Levy, was dispatched by his editor to find them. It was his first job. The Princeton Hospital did not have it, but they were found eventually in Wichita, Kansas, as Levy explained in a recent TED video (here). When asked whether any research during the previous 23 years showed Einstein’s brain was different physiologically from a ‘normal’ brain, Harvey replied, “Not yet”. After much travelling and many false leads, Sugimoto has a eureka-moment in California with Einstein’s granddaughter by adoption, Evelyn Einstein (1941-2011). Convinced she was actually the great physicist’s biological daughter, a brain sample was used in a (negative) paternity DNA test. It came from a Dr Harvey in Lawrence, Kansas. When the two finally meet (45 min. 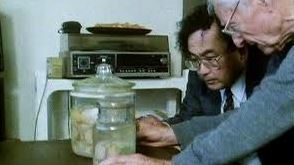 ), Sugimoto asked Harvey about the research on Einstein’s brain during the previous 39 years. “We’ll get a good study done eventually,” he replied. Slicing off a small piece of ‘brain stem cerebrum’ with a kitchen knife in his modest apartment, Harvey gifted it to him (right). Overwhelmed at reaching the end of his 30-year quest, Sugimoto prayed that it was indeed “the real Einstein’s brain and not dog brain—after speaking to so many people, and being given so many false leads and lies.” In the final poignant scene, he celebrated in a very Japanese way: at a local karaoke bar (video here). “I am born in Nagasaki two years after bomb. Einstein is made responsible for the bomb, but I do not blame him. I still love Albert Einstein,” he said. Two years later, there is a sequel. The 84-year-old Harvey is driven across the US to California by Michael Paterniti, another journalist and writer. In the trunk of their Buick Skylark is a grey duffel bag. Inside is Einstein’s brain, floating forlornly in a Tupperware bowl. Destination Evelyn Einstein. It is all there in Paterniti’s first book, Driving Mr Albert: A Trip Across America With Einstein’s Brain. He covers most of the bases, even travelling to Japan to meet Sugimoto. After seeing the brain sample and hearing about Kinki University’s Einstein Museum proposal, they go to a karaoke night. The following link captures Paterniti being read his description of that evening during a September, 2000, This American Life segment: You Don’t Have To Be An Einstein. In 1998, Harvey reportedly delivered the remaining uncut portion of Einstein’s brain to Dr Elliot Krauss, a pathologist at Princeton’s University Medical Center. Other remains of Einstein’s brain are now in Maryland’s Silver Spring National Museum of Health and Medicine (NMHM). Harvey’s heirs transferred them there in 2010, together with 14 ‘never before seen’ photographs of the whole brain.  Both items appeared in a 2013 What can we learn from a brain? Exhibition at the Museum. Also featured was the brain of Charles Guiteau. Its previous owner assassinated President James Garfield in 1881, while ‘mad or insane’. Grim company. NMHM also has an Einstein Brain Atlas App and Gallery Installation, where visitors can “interact with hundreds of life-size, ultra-high resolution slides of the Nobel Prize-winning physicist’s neuroanatomy via a virtual microscope system.” Meanwhile, the (fruitless) quest to discover a physiological explanation for the man’s brilliance goes on and on. So after a lot of horsing around – and thousands of post-mortem miles – Einstein’s disappearing brain finally ended up in Maryland. His genius, however, is not in a museum. It is elsewhere and everywhere. At the very end of his life Einstein ‘muttered two sentences in German’, then took two final breaths. The duty nurse, alas, did not understand the language. Perhaps he said (again): “Two things are infinite: the universe and human stupidity. I’m not sure about the universe”. Not long ago I finished reading the book ” A World Without Time” by P. Yourgrau which I found fascinating. A study of physics and the friendship between Einstein and Kurt Goedel who was the only colleague to be on equal terms with the master.